What is Tachymeter on a Wrist Watch ? Tachymeter Bezel fitted on your analog Wrist Watch helps you calculate speed and distance. Looking at the Tachymeter bezel you get the distances and speeds without doing any calculation anything. Tachymeter is thus an instrument always available on your watch like a calculator on which against the time in seconds you get your speed and distance travelled. MatsClock-1063 is designed with a tachymeter in mind. I have graduated the Tachymeter Bezel with figures corresponding to each position the seconds needle stops for a second. So if you know the number of seconds an event has taken place then you know how much is the speed of the event. How Tachymeter on Wrist Watch Work? Tachymeter works on a simple principle 3600/t. Here t is the time taken for an event to occur like how much time you took to walk a certain distance or how much time your car took to cover one kilometer etc. 3600 is the total time in seconds in one hour. It is 60 seconds multiplied by 60 minutes. All the watch companies like Fossil, Tissor, Citizen, Titan, Rolex have used tachymeter on some of their wrist watches. The watches are graduated according to the watch company's wish. I have graduated MatsClock-1063 with accurate figures against the seconds. But most watch companies like Fossil, Rolex, Tissot, Citizen, Titan etc use graduation only in multiples of hundred's or fifty's. How to Use Tachymeter on Your Wrist Watch to Calculate Speed? Tachymeter on your wrist watch can be easily used for calculating speed you are walking or the speed at which your car or bus or your aircraft is travelling at. For this either you should note the time in seconds or you should have a stop clock or a seconds needle that can start and stop with the press of a button, or your watch should have the tachymeter bezel itself capable of rotating to the start time incase a stop clock facility is not available. Alternately, to find the speed at which you are walking or the speed of your car, you need to start the stop clock or not the time at starting point and then stop the clock at the finish point or note the time again. The number of seconds you walked or the number of seconds your car took to travel between the starting and finishing point will represent a number on the tachymeter bezel on your analog wrist watch. This is the speed at which you walked or the speed at which your car was travelling. If you had taken the distance travelled in kilometers then the answer is also in kilometers. If you had taken your walking speed in meters then the speed you get is also in meters per second on the tachymeter because 3600 seconds divided by t seconds you took to walk or your car took to travel a certain distance is just a ratio and has no unit. So the ratio will take up the same unit you took for measurement when using the tachymeter on your watch. How to Use Tachymeter on Your Wrist Watch to Calculate Distance? Tachymeter can be used to calculate distance travelled also. The technique is exactly same as the speed calculation. This time you know your speed and you want to use the tachymeter bezel to read the time taken to do one unit. Say you are travelling at a speed of 60 kmph. You already know that you cover 1 km in every minute or 60 seconds. If you were travelling at say 65 kmph, do you know how many seconds it will take? Just look at the numeral 65 on the Tachymeter bezen on your wrist watch. If you notice 65 is written against 55 seconds. That means you will cover a distance of 1 km in exactly 55 seconds. let us take example of walking. I am sure you have understood now. How to Use Tachymeter to Calculate Your Train's Speed? Tachymeter is easy to understand and useful in this train speed calculation example. There is now way you can walk up to the train's engine to find out what speed your train is travelling. But you can find out your train's speed in few seconds using the tachymeter on your wrist watch. You can see the milestones along the railway track when you look out of the train's window. Note the time when you cross the first milestone and note the time again when you cross the second milestone. Let us say you get 25 seconds between the two milestones. This means that your train is travelling 1 mile every 25 seconds. Now look at the tachymeter on your wrist watch. Read the figure on the tachymeter on your watch against 25 seconds. What does it read? Your tachymeter reads 144 which means that your train is travelling at a speed of 144 miles per hour. Miles per hour because the distance you took was in miles. If you were to take the distance in meters then the answer would have been in meters per hour. Using a tachymeter on your watch to calculate speed and distance is as simple as that. Tachymeter Wrist Watches Limiatations ? Tachymeter Watch Limitation - High Even Speed. Tachymeter is not accurate for events happening in less than 5 seconds. Some wrist watch models of companies like Tissor, Swiss, Titan, Rolex, Citizen, Fossil are known to have tachymeter bezel with numerals only up to 400 or till the 8 seconds limit as they consider the tachymeter to be either inacurate for events occuring in 7 seconds and less. The other reason could be that the tachymeter bezel on these wrist watches are not wide enough to write other numerals or the numerals look to be too close to each other and difficult to read by the user even if it is written. The other reason could be that they do not consider that people using a normal watch will ever need to measure an event happening at speeds faster than 400 an hour. With this kind of a tachymeter you cannot be measuring a high speed event. Tachymeter Watch Limitation - Interpolation. Normally the Tachymeter on your Wrist Watches are usually graduated against seconds. What if the event is taking a time in decimals. Tachymeter will thn need to be interpolated for events taking time in decimals of seconds. But your clock stops at each second mark. So to get a better accuracy you may buy a tachymeter watch see that the clock has a needle that does not jump seconds but it moves smoothly. If your tachymeter watch has a smooth moving seconds needle then you can stop it whenever you want and you will get time in decimals of seconds as well. This makes the time taken very accurate but the tachymeter on your wrist watch has numerals against whole seconds only. So the tachymeter needs to be interpolated to get the reading of Speed which may not be very accurate. If you see most of the Tissot, Swiss watches, titan, Fossil and other watches you will find that the tachymeter is not graduated against seconds, but the numerals on the tachymeters are in whole numbers and off set from seconds to a place where the actual whole number falls. This is confusing to user as he may think that it is an error on the tachymeter bezel. In the tachymeter of MatsClock-1063 you will find actual numerals written against each seconds on the watch dial. You will 103 written against 35 seconds on MatsClock-1063 compared to finding 100 written a little after the 35 seconds on the major watch company tachymeter bezels. Digital Tachymeter Watch Disadvantage. Today most watch companies are shifting to digital watches which cost less and are more accurate. The digital tachymeter also happens to be very accurate and you do not have to look at the time. Just start and the stop the tachymeter and read the speed on the tachymeter digital display. There are two disadvantages of having a digital wrist watch tachymeter. Tachymeter Makes Analog Wrist Watch Beautifully Sophisticated. One of the main advantage of the tachymeter bezel on an analog wrist watch was that the analog watch looks beautifull and sophisticated with a well designed tachymeter bezel on it. In the digital wrist watch, the bezel goes missing. Thus the sophistication and beauty of a tachymeter is clearly visible on a digital wrist watch. Tachymeter on Digital Wrist Watch Difficult to Find and Use. Like most functions available on a digital watch is hidden from a normal user. Unless some user becomes curious to find and use all the functions of a digital watch, the tachymeter in its digital avatar goes unnoticed. More over to use the digital tachymeter the user needs to try and locate the tachymeter with many press on the button. Tachymeter on Digital Wrist Watch Difficult to Read. 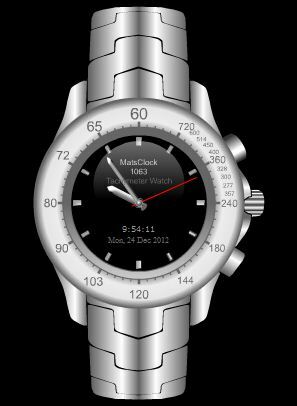 The wrist watch in its digital form is very difficult to read because the digits come in black on a white or green screen which are very difficult to read especially by night. This means that tachymeter also becomes difficult to read. If your age is over 40 then you need glasses to read the digital tachymeter. But the analog wrist watch needles are easy to read even with failing eye sight. Thus digital tachymeters have a serious limitation. I am sure after reading this article, you will sure that the next watch you buy will have a beautiful tachymeter bezel with grading clearly readabe. And you will use tachymeter often now that you have the full knowledge of how to use a tachymeter watch and what are the advantages and disadvantages of a tachymeter watch in its analog and digital forms. Time is life. Watch is life. Tachymeter measures how fast you are losing time, covering distances and at what speed you are living your life. Enjoy your life and use tachymeter even to measure your joy. And thanks for reading through my article.